A Monster Calls by Patrick Ness has been on my TBR list for an embarrassingly long time. I finally picked it up last night and although I am not on page 56 yet, I am already waiting with Conor for the monster to call. The whole room was like a museum of how people lived in the olden times. There wasn't even a television. That was in the kitchen and almost never switched on. He read. What else was there to do? Oh Conor, nothing else is worth as much as spending your time reading. *Guess you've realized he was describing his grandma's house. Has anybody seen the movie yet? Of course I first want to finish the book and then I'll watch it. But the trailer does look simply marvelous. Let's join Gilion @ Rose City Reader now for Book Beginnings. 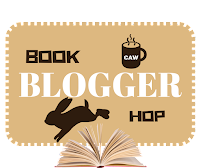 Every Friday we share the first sentence (or so) of the book you are reading, along with your initial thoughts about the sentence, impressions of the book, or anything else the opener inspires. Please remember to include the title of the book and the author’s name. I am really getting into audio books now. 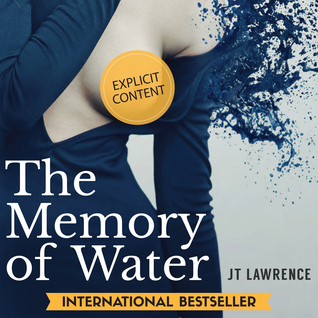 I've finished Eleanor and Park yesterday and plan to start with the brand new audio recording of the acclaimed The memory of water by one of my favorite authors, JT Lawrence. It will be my first time using audible and I promised Janita a review. Guess I will have to keep a notebook nearby. Or I can just use one of my colored pencils and scribble on one of my querkles, dot-to-dot, or color by numbers books. *Oh how the old yearns for the joys of the young. My little sister's body was blue when they pulled it out of the river. Such a small thing, she was.Usually the shock of it would make one disillusioned, confused, blurry. Not me. I can already see I will need to stay very focused here. Love it. Today's questions: Do you ever "go back" to when you first started blogging? My Answer: Yes I do. I sometimes go back to "fix" my post. No, I've never edited text at all. It's been written. It's on the wall. Leave it there. I just fix an image or a layout every now and then. To be really honest, I sometimes miss those early days of blogging. I spend hours drafting a post or a review last year. I was sooo excited to press publish and see all the comments. This year just doesn't happen at all. But this too shall pass. Just give it time. One of these days those days will come back. Talk to me! - How are you spending your weekend? Editing old posts or just reading? I remember spending hours on reviews. Now, I feel like I don't have as much time. I do go back sometimes and fix links. I'm in the process of adding more links to those older posts. But other than that, those reviews are done. I agree! Really only when I go back to make a link and "see" something can maybe be fine tuned a bit, I do it. Otherwise, I leave those posts alone! Both books sound really good though that 56 sounds so sad. Patrick Ness is on the authors I really should read list but I've yet to actually do it. Hopefully you'll find your excitement with blogging again soon. Don't think The Memory of Water is suppose to be sad, still waiting/listening to see/hear. Gosh the audio books are weird. But I do enjoy it. I also haven't read Patrick Ness before, I am only about 14% in, but it is a gripping story with some good writing. Hope you will have a good weekend and thanks for stopping by! I've been meaning to read A Monster Calls, and this excerpt tempts me further. The Memory of Water also sounds good. I do sometimes go back to older posts and see if there is anything that I want to bring forward. I am surprised sometimes by what I find. I really enjoy A Monster Calls, but not quite sure what is going on in The Memory of Water yet - but sure I will grasp it eventually. Love JT. Lawrence's work. Hope you have a good weekend and thanks for returning the favor! This was a wonderful book. And I want to see how the movie goes too. I do go back and read earlier reviews. I sure spent a lot more time on them. I've changed somewhat, trying to just talk about a book rather than breaking it down into parts. I also find that I used to spend way more time on reviews when I just started blogging. I still do on occasion and funny enough, those are the reviews who get the most likes and comments. Maybe that's not funny at all, maybe we SHOULD just spend so much time drafting the "perfect" review! Interesting excerpts. I haven't read either book. I have Dead Man's Bridge by Robert J. Mrazek this week. Happy reading! Will have a look Kathy. Thanks for stopping by and have a good weekend! 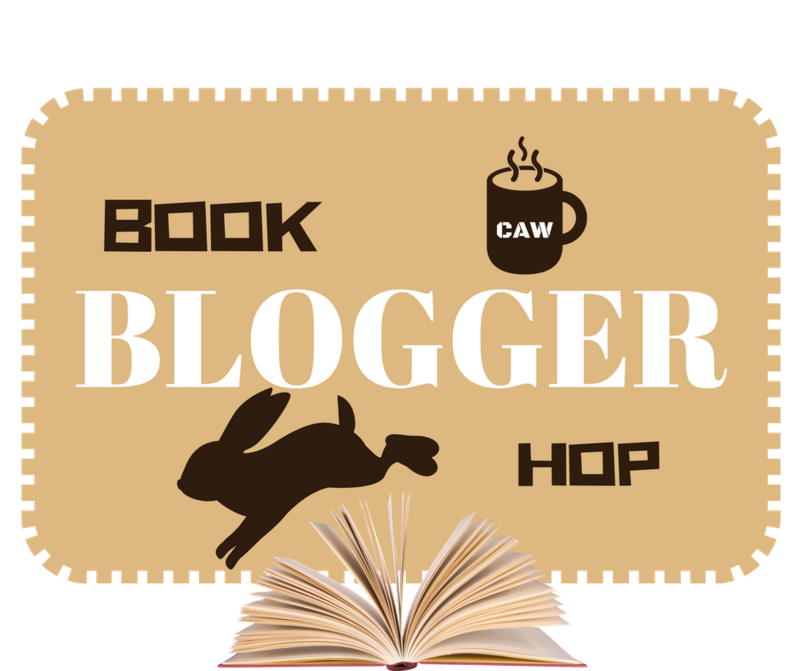 Great answer to the Blog Hop. I don't change anything on a past post, but I just re-read them and laugh sometimes. 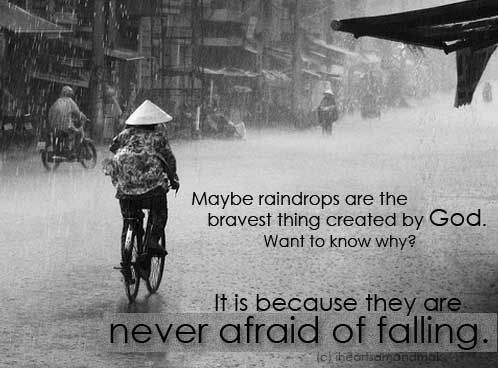 I LOVE your photo about rain. So cute and so true. As long as you laugh and not cry at your older posts! Thanks for stopping by Elizabeth and have a good weekend. I also used to really enjoy writing and prepping blog posts. Now I just can't seem to feel that same spark. It takes so long to write each review post that sometimes I just don't have the energy to finish. But we will persevere, and hopefully that joy comes back. Same boat as you yes, but it will return. And every now and then you read a book and you feel that old spark flicker. I've finished Jodi Picoult's Leaving Time this week and the spark was soooo there. This is a book I have had on my wishlist for an embarrassing long time! :-) Happy weekend! LOL!! It is a quick and a good read! A Monster Calls by Patrick Ness has been on my TBR list for an embarrassingly long time too :) I'm planning to read on this month! I am seriously contemplating just deleting my TBR list, but every now and then I do browse through the endless list and come across a treasure like A Monster Calls. Worth the read, hope you get to it soon. Thanks for stopping by! Hope you have a good weekend. It is worth the read, every now and then I just want to delete the TBR list, but then I would have ended up forgetting about little treasures like these. Oh, I love A Monster Calls. I haven't seen the movie, but I actually want to do a reread before I do. Happy weekend! The book is a quick read. I hope to finish it between today and tomorrow, then we can watch the movie tomorrow night! Thanks for the visit and have a good weekend! Yeah!! How are you Lauren? Thanks for the shout out! I enjoy the book a lot and the trailer does seem good. 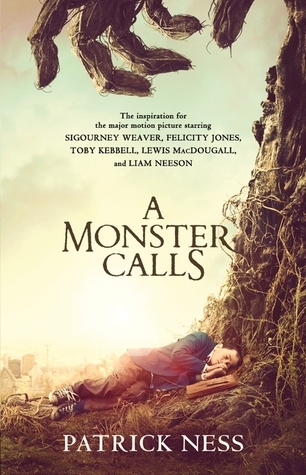 Hope you'll enjoy A Monster Calls. I've not read the books but just won a double pass to see the film, so I'll try to get to that in the next week or so. Lucky you! Hope to finish the book within the next day or so and then watch the movie. Halloooo! You should really try one of JT. Lawrence's books. I'm sure you will love it. Thanks for stopping by and have a good weekend! Hi Bev! Oh gosh, you have to read A Monster Calls. It is beautiful. The movie is also great! I love Janita's work, but I did not enjoy the reading of The memory of water. Story was great though!